Heat Treating Sheets mimimize tool wrap waste. Offering alternative to standard tool wrap rolls, 12 x 24 in. Type 321 Heat Treating Sheets accommodate majority of parts, especially those heat treated in small bench type furnaces. Package allows easy access to each individual sheet and protects from dirt and damage during storage. Excess material can be conveniently stored flat in box. Products are available in 10, 20, or 30 sheet packages. 12" x 24" Type 321 Heat Treating Sheets Is Now Available from Precision Brand! Precision Brand Products introduces a safer, more economical alternative to the standard tool wrap rolls, 12" x 24" type 321 Heat Treating Sheets. The sheet design keeps handling to a minimum. The 12" x 24" sheet size has been tested and chosen to be the optimum size to accommodate the vast majority of parts, especially those heat treated in small bench type furnaces. Individual sheets are easy to access and fabricate, requiring one cut or less to form into a usable heat treating envelope for the part. Less handling means less risk of being cut. The new 12" x 24" Heat Treating Sheets are conveniently packaged for easy handling and storage. The unique package allows for easy access to each individual sheet and protects from dirt and damage during storage. Excess material can be conveniently stored "flat" in the box. Packaged in convenient 10, 20, or 30 sheet packages, there is a quantity for every size, shop, or lab. The sheet design means less waste from excess handling and improved product performance. 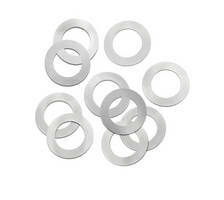 Stainless Steel Arbor Shims are corrosion resistant. 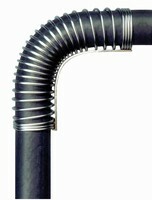 Stainless Steel Coil extends life of hose assembly. Interlocking Shims conform to irregular shapes. Branded Shim facilitates product identification. Steel Blackener is offered in gel formulation. Sealed Air Form-Fill-Seal Shrink Systems offer speed, flexibility.